If so, AG General Construction Ltd will make every effort that your dream of bathroom renovation and bathroom fittings would come true. The skills of our craftsmen tillers are unparalleled in their ability to create beautiful walls and tiles that are virtually a work of art. We can fit most styles of tiles including limestone, stone tiling, marble and ceramic. Many clients desire more than just a ceramic tile- we work with all natural stone, slate, terracotta, glass, mosaic and porcelain to give a finish of timeless elegance. We use only the highest quality impregnators and sealants to ensure the durability of the tiles and to maximise resistance to water, oil, grease and other stains. If left untreated, the porosity of most natural stone will absorb unsightly stains detracting from appearance and cleanliness. AG General Construction Ltd experienced plumbers are available for all your plumbing needs, from a dripping tap to a full bathroom installation. 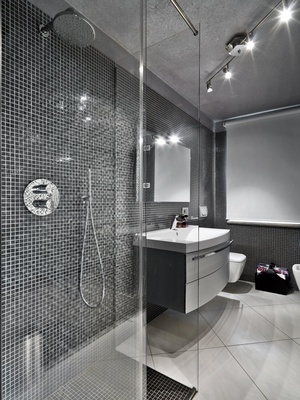 Our team can convert your bathroom by moving all the units: toilets, towel racks, aqua flow toilets, radiators, taps, shower mixers, underfloor heating, fogless mirrors, extractors and etc. We have ability and equipment to install showers, power showers, steam showers, baths, jet baths, jacuzzi, sauna. Our plumbers are installing the plumbing pipes into the walls, have a knowledge to work with booster pumps, basement pumps, macerators, mulches.